Cardinals is sound designer and composer Simon Stockhausen's presentation of dualism in all sort of realms. You'll find dark and light, tonal and atonal, serenity and anxiety, and eastern and western scattered across the Achromatic and Chromatic Percussion, Danger Zone, Keys, Synths, Strings, Pads, Textures, and Scapes categories. The 109 presets encapsulate their own enclosed universe for many hours of exploration. Microsound Textures is all about precision, details, subtlety, and complexity. Richard Devine’s idea was to use grain particles and tiny pulses to create rich and dense textures. In addition, the collection includes a wide variety of surprising and mysterious instruments ranging from light and delicate to dark and atonal. The 128 sounds are divided into five categories: Percussion, Sound Effects, Keys and Synths, Pads and Strings, and Textures and Ambience. Synbiosis is sound designer Daniel Stawczyk’s fifth volume in the Sound Bank Series, and his first for Chromaphone 2. This 130-preset collection presents arpeggiators, basses, bells, keys, synths, and effects that truly exemplify what can be achieved when a sound designer works organically with a synthesizer. Wherever your destination, Synbiosis puts forward the perfect vehicle to explore the fundamental nature of Chromaphone 2. Long time Chromaphone user Christian Laffitte sends us his first contribution to the Sound Bank Series with the high impact Cinematix. Whether it’s epic scenes or fast-paced pursuits, with its strong emphasis on monumental hits and percussions, Cinematix is sure to fuel your next score. Cinematix gathers 100 presets grouped into percussions, snares, toms, cymbals, chimes and bells, hits, strings and pads, effects, and arpeggiators. Long time AAS contributor Thiago Pinheiro delivers the highly versatile Multiverse, his first contribution to the Sound Bank Series. The 100-preset collection packs otherworldly textures, unusual melodic and percussive elements as well as a range of dynamically rich instruments that are particularly well suited for cinematic soundtracks and sound design. The synthesis expertise of acclaimed virtuoso and music technology pioneer Thiago Pinheiro is at your fingertips, with each patch overflowing with interactive possibilities and instantly useful combinations. From organic sounds to sci-fi scores, from abstract ambiences to cutting edge grooves, transitions and unique arpeggiators: surprise yourself with Multiverse’s full expression, responsiveness and sonic depth. 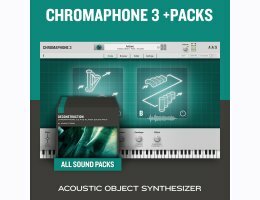 Digital Sins forces Chromaphone 2's acoustic object algorithms into a non-acoustic synthesizer world. The collection presents bright and ultra sharp sounds reminiscent of the classic digital synthesizer's precision and presence. The 144 presets are categorized into basses, bells, keys, chords, synths, soundscapes, and effects.